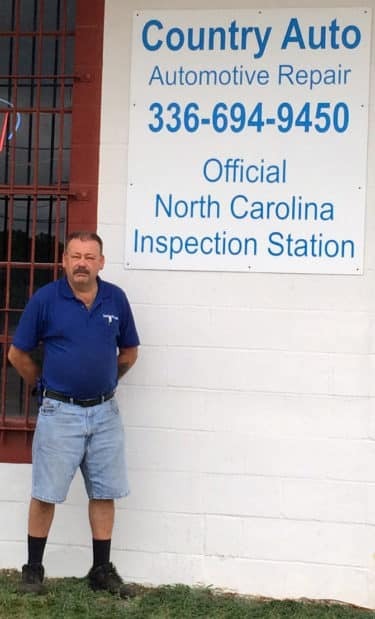 Country Auto: Automotive Repair/Official North Carolina Inspection Station just moved from Mebane to Yanceyville. According to Joe Truskowski, the owner, “The new place has more space.” So Joe is looking to at expanding his business. Joe explains that at Country Auto, he offers general automotive repair, brakes, transmissions, engines, State inspections, anything that sets the “Check Engine” light, and more. Joe has been working on cars for over 30 years, and he says that he can repair any type of car. He says currently at Country Auto, “We do a lot with Caswell Correctional, the jail, the Sherriff’s Department and the prison. Joe explains that he originally started working on cars because “I didn’t want to pay anybody to work on my own car”. His first car was a Plymouth Fury. According to Allpar.com, “The Fury was a favorite of many police forces and was adopted by the New York Police Department. The story goes that the city’s Fords failed to stay together during a drug chase, fictionalized in the movie, The French Connection, while a single detective in his personal Plymouth was able to catch the bandit because his car could take the pounding.” This was the cool car that inspired Joe to become a mechanic. Other members of Joe’s family aren’t as into cars as Joe is. “Some of them tinker. I’m the only one really”. Joe is self-trained and also went to Virginia Beach Technical College to study mechanics. Even though he was only 20 minutes from the beach, he didn’t let that distract him from his schooling. Joe explains, “I was born and raised in Norfolk, VA. I spent every weekend at the beach. It got boring”. Joe preferred working on cars more than working on a tan. Joe worked 8 years for Wilson & Sons, and two years ago, when Wilson retired, Joe took over the business and changed the name of the shop to Country Auto. When asked how long he usually takes to fix a car, Joe say, “It depends on what’s wrong with it. It usually doesn’t take more than a day. It depends on what kind of job it is…whether its something major or simple”. One way that Joe makes sure his customers are well treated is through the amazing talents of his receptionist, Debra Livingston. Joe admits that Debra is a complete gem, but he says, “Don’t tell her that. You’ll give her a big head. I gotta keep her on her toes”. In the summer, Debra works full-time at Country Auto, but when the school year starts, she drives a school bus during the day and works part-time at the auto repair shop. Debra is the friendly voice that greets customers, and potential customers on the phone, keeps track of the scheduling, and keeps Joe on his toes. Debra explains that Joe takes repair jobs primarily on a “first come, first served, basis. To find out more about Country Auto or to schedule some auto repair, contact Joe or Debra Livingston at 336-694-9450 or go visit the shop at 1142 Main St., Yanceyville, North Carolina 27379. Country Auto was previously located near Burlington at: 10331 NC Hwy 119 South, Mebane, NC 27302. Come on over to the new expanded location in Yanceyville, NC.